Three month project is over and I can share the result. I built all missing components to make it able to develop iOS projects using Windows and Linux host. depending on operation system and arch from screenshot above pick package to download. 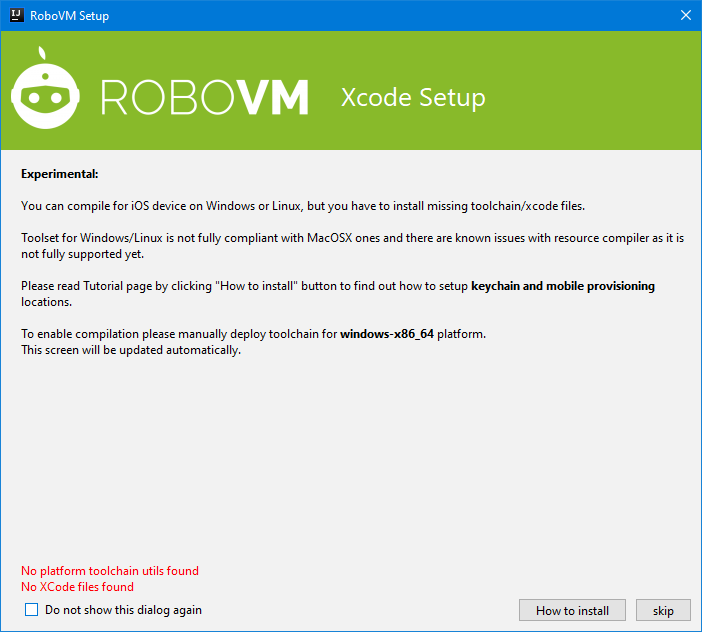 change dir to ~/.robovm/platform/ (create if missing) and unpack package. UPDATE: there is homemade SDK available. Provide Xcode files. .tbl and device images are needed to run code. Its not allowed to distribute these files due copyright moments. copy backup xcode_app.zip to target platform, change dir to ~/.robovm/platform/ and unpack xcode_app.zip. At this moment there should be no red lines about xcode/toolchain and installation could be completed. Run/Debug project same way as on MacOSX.